euthanasia – It's Time to Read! The story follows Lou Clark as she searches for her identity. She has always been reliable Lou who works at the cafe until the day she loses her job. In her pursuit of a new job, she becomes Will’s companion. Will felt like he lost his life in his motorbike accident. He will never fully recover and live the life he led before. Lou’s role seems simple: keep him company. However, she soon realises her role is much more than that. Will had made a bargain with his Mum – he would give her 6 more months and then he wanted her help to die. Lou is determined to give him a reason to live and from that she finds her new identity as she faces fears and challenges she has never had to deal with before. I really enjoyed this book. I found I couldn’t put it down as I was sucked into the story. I immediately liked Lou. She went from a quiet girl to a girl with such drive. She wanted to succeed and I found myself cheering her on. She was so likeable and I admired her ambition. Will had to grow on me, but I think that is what Moyles intended. He started out grumpy and aggressive but as we delved further into the book and further into his character, I found myself wanting him to live and to embrace this new life. I thought this was a very well written and carefully thought out book. It isn’t soppy romance at all. It is almost a study into Will’s disability – he is quadriplegic – and the effect that would have on someone’s life. This is controversial as it addresses the issue of euthanasia but it is straight forward and to the point. As I was reading this book I was reminded of Jodi Picoult – Moyles’ writing style is not dissimilar to Picoult and she asks tough questions. I didn’t like the ending of the book and I don’t particularly like the cover – it portrays the book to be something that it isn’t. However, this book did move me. 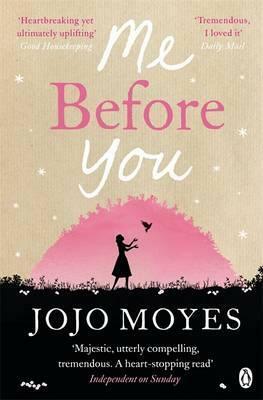 I did cry whilst reading it and can only give this book praise. This is well worth reading.